Facebook today rolled out a new feature for its News Feed that will allow people to temporarily silence friends, pages, and other content they don't want to see. Selecting the new Snooze tool, which appears in the drop-down menu on individual posts, lets people unfollow any person or page for 30 days. The move is not permanent, and your account will automatically re-follow the Snoozed person or page after a month. Facebook says it will not notify those who've been Snoozed, but it will notify people when the Snooze period for pages is about to expire. Snoozed pages can be re-followed manually at any time. The tool is rolling out over the next several weeks. 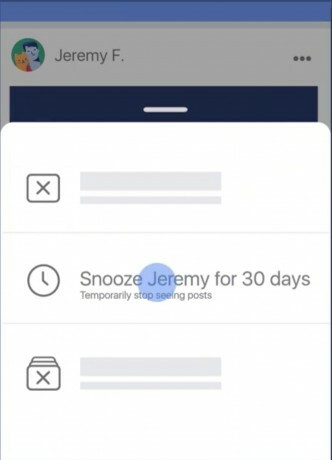 Facebook today said it is testing a new feature for the News Feed called Keyword Snooze. The tool lets people temporarily hide posts that contain certain keywords. Google today said its personalized feed will begin to appear in the Google mobile app for Android and iOS devices. The feed, which Google has been testing on Android since late last year, displays information cards below the search bar based on each user's individual search history. Instagram today rolled out a new tool that allows people to follow hashtags in addition to individual accounts. The idea is to make it easier to discover photos, videos, and people. Instagram today made it possible to share feed posts directly to stories. The latest version of the app includes tools that make it easy to share a post published in your feed to your own story as a sticker where your friends and followers can see and interact with it.